Senator Janice Bowling has become a broadband hero in rural Tennessee and on the pages of MuniNetworks.org. Year after year, she introduces legislation aimed at expanding local authority to allow communities the ability to improve connectivity. She’s back this year with several bills aimed at expanding fiber in rural areas. Like Bowling’s past legislation, related bills SB 489, SB 490, and SB 494 grant municipal electric utilities the authority “to provide telecommunications service, including broadband service” and specifies that they can do so beyond their electric service area. This change in the current law would allow places like her own community of Tullahoma to expand to serve neighboring towns. There is no fiscal impact from the Senator’s bills. Bowling has seen firsthand how access to fiber optic infrastructure, such as Tullahoma’s LightTUBe, lifts economic development, improves educational opportunities, and helps a local community reduce costs. The city has thrived since investing in the network in 2009, while many of the communities that have had to rely on subpar service from the larger incumbents have limped along. SB 489 also extends authority for municipalities to collaboration for telecommunications and broadband service, to ease any uncertainty about public-private partnerships. 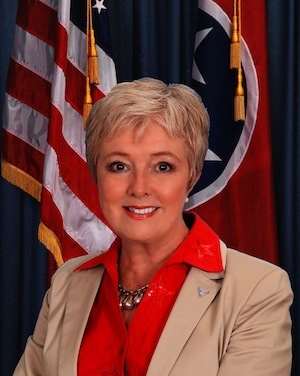 Tennessee State Senator Janice Bowling, a Republican from Tullahoma, has once again introduced legislation that would help bring high-quality connectivity to rural residents and businesses. The bill is not complicated and would allow municipal electric utilities that offer broadband connectivity to expand beyond their electric service area. In a video from 2015 Senator Bowling takes a few minutes to explain her proposal - to eliminate the restriction and allow places like Tullahoma, Chattanooga, and Clarksville to serve neighboring communities. This year, the bill that eliminates the restriction is SB 1058 and its House companion is HB 0970 from Representative Dan Howell. For now, her bill is in the Senate Commerce and Labor Committee waiting to be heard. Sen. Bolling has also introduced similar bill that allows municipal electric utilities to offer telecommunications service with no geographical limitations. Senator Bolling gets it. She understands that the people of her district and the rest of rural Tennessee need high-quality connectivity to keep pace with areas that already have such access. We’d like to see more legislators like her who put the needs of their constituents before the interests of the big cable and telephone companies. In the video Senator Bolling describes why the bill, which she has introduced several times, has not passed. She explains what the bill does legally and practically, and she gives a frank assessment of what the situation is now in many rural areas of her state. Even though the video is from 2015, her comments are still relevant. The video is short and to the point - only 4:20 - check it out and share. While Tennessee Governor Bill Haslam’s “Tennessee Broadband Accessibility Act” has been in the news, several other Legislators have introduced companion bills earlier this month that deserve attention. SB 1058 and HB 0970, from Senator Janice Bowling and Representative Dan Howell, would allow municipal electric utilities, such as Chattanooga’s EPB, Tullahoma Utilities Board, or Jackson Energy Authority to expand beyond their electric service area. SB 1045 and HB 1410 reclaims local authority for municipalities that want to offer telecommunications service either alone or with a partner. HB 0970 has been assigned to the House Business and Utilities Committee; SB 1058 was referred to the Senate Commerce and Labor Committee. Bowling has also introduced SB 1045, a bill that allows municipal electric utilities and electric cooperatives the ability to offer telecommunications services either on their own or with private sector partners. SB 1045 and it’s companion, HB 1410, sponsored by Terri Lynn Weaver in the House, specifies that there are to be no geographic limits to the service area. SB 1045 and HB 1410 are also in the same committees as SB 1058 and HB 0970. The EPB challenged restrictive state law in 2015; the FCC determined that the law was inconsistent with federal goals. The agency preempted both Tennessee and North Carolina's laws that inhibit municipal electric utilities from expanding. When Tennessee and North Carolina appealed the FCC decision, however, the appellate court determined that that states had the right to impose those laws on local communities and reversed the preemption. Tullahoma Utilities Board (TUB) recently celebrated its 3,500th Internet customer, rewarding the lucky LightTUBe subscriber with a $350 bill credit. TUB has offered Fiber-to-the-Home (FTTH) triple-play services to the Tennessee town of 19,000 since 2009. LightTUBe now boasts an estimated market penetration rate of 39 percent, despite competition from publicly-traded incumbents Charter, Comcast, and AT&T. LightTUBe delivers $90 per month symmetrical gigabit connectivity (1,000 Megabits per second), so upload and download speeds are equally fast. LightTUBe also offers other affordable options and has repeatedly lowered prices and increased speeds. TUB successfully stimulated economic development with its LightTUBe service, attracting businesses like J2 to Tullahoma. It has also enabled smart metering and other cost-saving measures that are a boon to the local community. Yet, Tennessee state law preempts public utility companies from providing Internet services to communities beyond their electrical grid. With little meaningful competition, neighboring communities have no alternative to incumbent providers. Tullahoma Utilities Board LightTUBe customers are once again receiving a special holiday gift via the municipal fiber network. As of December 5th, subscribers got a boost in speeds with no boost in price. More good news is on the way after the first of the year. According to General Manager Brian Skelton, rates for the two highest tiers will decrease. Symmetrical gigabit Internet service will drop from $99.95 per month to $89.95 per month and 200 Megabits per second (Mbps) symmetrical Internet service will decrease from $79.95 per month to $74.95 per month. Unlike the big corporate providers that increase rates whenever the opportunity arises, Tullahoma prefers to increase speeds for free and sometimes even lower rates. Publicly owned networks focus on serving the community rather than maximizing profits; the decision to increase speeds and lower prices comports with their mission. In a video calling for "Broadband Equity," the Tennessee Fiber Optic Communities have released a video explaining why communities must have their local Internet choice restored. We encourage you to Like and Follow their campaign on Facebook. The Center for Public Integrity has followed the local choice debate closely. Their team has travelled to Tennessee and North Carolina to talk to lawmakers, visited communities seeking high-speed networks, and dug deep into the source of influential campaign funds. Allan Holmes and his team have assembled a collection of articles and audio that offers the right amount of history, backstory, and anecdotes to properly understand these issues. Employment in Tullahoma lagged statewide job growth before theLightTUBe was turned on. Since the recession ended in 2009, two years after the city began offering broadband, the city has outpaced job growth in Tennessee. The city added 3,598 jobs from April 2009 to April 2014, a 1.63 percent annual growth rate, about double the statewide rate, according to the Bureau of Labor Statistics. Republican State Senator Janice Bowling from Tennessee is once again speaking out in favor of local telecommunications authority. On Monday, she published an op-ed in the Tennessean titled "Don't limit high-speed broadband to big cities," noting that rural communities often have no choice but to build their own infrastructure to obtain fast, reliable, affordable Internet access for residents and businesses. Bowling refers to Tullahoma, her own home town, where economic growth is strong and Internet access is affordable. Tullahoma has a history of increasing speeds without increasing rates and now offers gigabit service for around $100. Unfortunately, Tullahoma is surrounded by communities it cannot help due to the state limitations. Unfortunately, public broadband networks are impeded by restrictive state laws that limit the power municipals have in providing services. In Tennessee, a 1999 law prohibits municipalities that operate broadband networks from providing service to anyone outside of the boundaries of their electrical footprint. This means that people in rural towns and small communities are still without high-speed Internet. They’re without educational and employment opportunities, improved modern health care, enhanced public safety or better-quality government services, among other benefits. As a senator representing seven rural counties and a resident of a small community myself, I am speaking out for all of those who are being held hostage to 20th-century technology. Let us grow our economies, improve our governments’ performance and create jobs for in our communities. Let us have Internet choice(s). The Tullahoma Utilities Board (TUB) began offering gigabit service in 2013 through its municipal FTTH network, LightTUBe. In a recent press release the TUB announced it has lowered the price of residential gig service to $99.95 per month. Skelton has said in the past that the decision to offer Gigabit Internet was an easy one. LightTUBe has brought jobs to the community, increased the efficiency of the electric utility through a smart metering program, and implemented a "TV Everywhere" option for customers. Even thought the network is restricted by state law, it has remained financially stable while keeping rates in check.